Venezuela apparently has some crazy driving -- running red lights, stopping in the middle of the street to drop off passengers, riding motorcycles on the sidewalks, driving in reverse through oncoming traffic, stuff like that -- and the standard law enforcement tactics haven't brought about sufficient improvement in the situation. 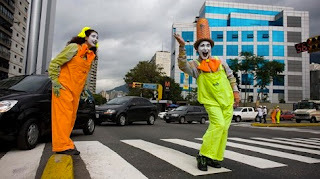 We definitely need traffic mimes!!! One of the best ideas I've ever heard. Maybe you should set up a meeting with the Governor?!?!? ...or, maybe you could BE a traffic mime! That would be a fun meeting: "Sir, I'm here to talk with you about a serious issue -- Utah needs more mimes."